The Qlaqs Scan app is your moblie scanner en route. Enter the combat against your document piles and deliver your documents into the Qlaqs WebCenter this very day. Digitalize with our scan app and use the complete functional range of the app for free. The Qlaqs Scan app is the faster, more compact and more practical version of your old scanner. The userinterface has been designed for an intuitive handling. After installation your first scan is only seconds away. 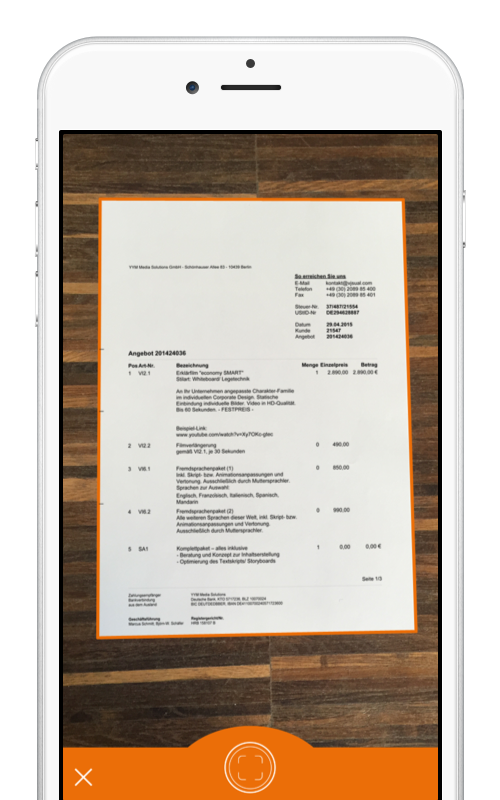 With only a few clicks you can digitalize and sign your receipts, documents, contracts, notes and business cards. The automated edge detection saves you to crop your scans. The scans can be saved as PDF, they can be delivered directly into the Qlaqs WebCenter and they can as well be shared via email, Dropbox, Google Drive etc. Cloud Connection - You can save your scans directly in the Qlaqs Cloud including project assignment. Signatures - You can open and sign customer reports directly in your Qlaqs Timesheet App. Save Signatures - You can create signature templates, fit them to the right size and insert them into your documents. Intutive User Interface - Easy to use, user friendly and chic. Edge Detection - Fully automated edge detection saves you the subsequent cropping of your documents. Perspective Correction - Oblique pictures? Not with Qlaqs Scan - the perspective will be corrected automatically for an ideal view. Image Editing - Image optimization and editing custom-made (black and white, gray scale, original colours). PDF Output - Save your data as PDF, export and share them directly in your app via email, dropbox etc.